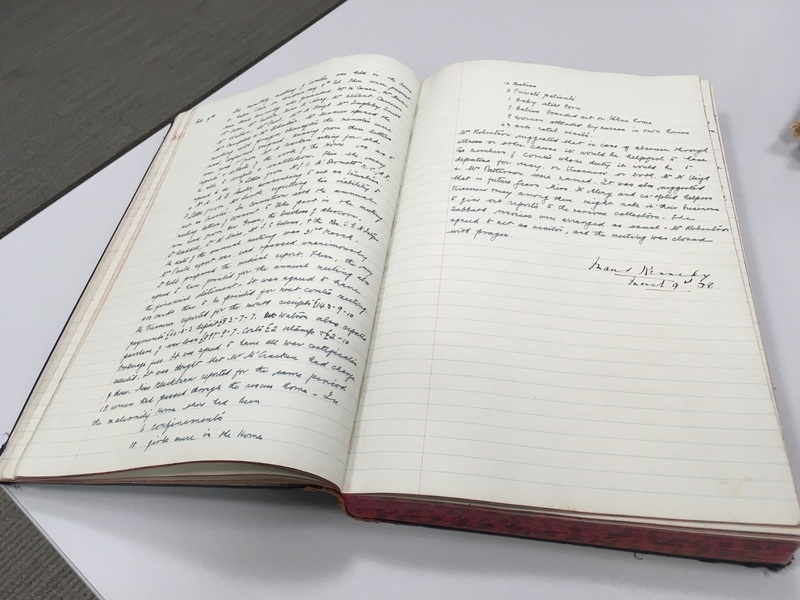 DOCUMENTS available to view at the Public Records Office of Northern Ireland (PRONI) provide a window into life in mother and baby homes, as well as the children’s homes where some of the babies moved to after their birth. 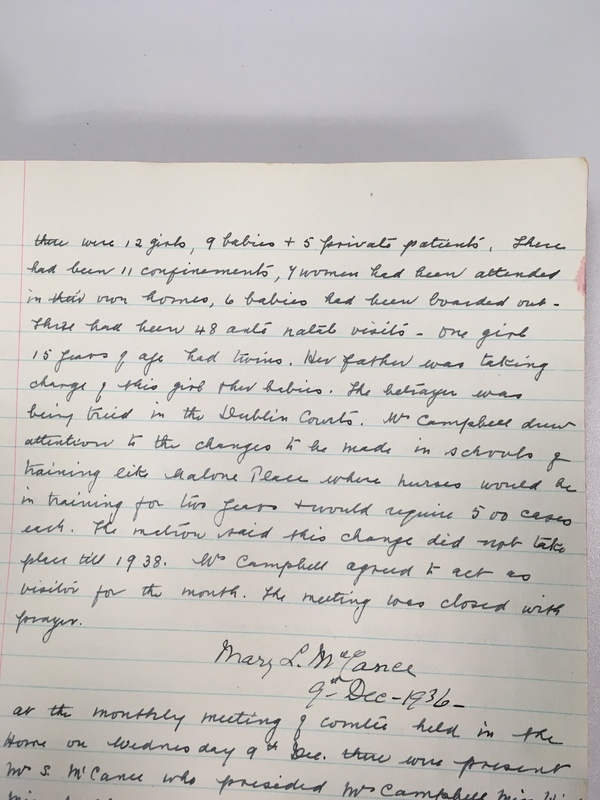 Many files have been retained by religious orders and other organisations, but among the papers and files open to the public at PRONI are correspondence with government departments, inspection records and a minute book. We also looked at Welfare Authorities Annual Statistics held by PRONI. This included files containing statistical returns relating to children in care, including at mother and baby homes. In 1969, for example, 1,644 children were living in care with 633 described as “illegitimate”. Documents show that 499 final adoption orders were granted by the courts in 1969 and 363 children were discharged from care for adoption in the five years 1965-69. Belfast Midnight Mission for unmarried mothers was based in Malone Place in Belfast. The admission register for this former mother and baby home is closed to the public. However, we were able to access the home’s minute book (see photograph above) covering the 15 year period from 1934-1949. 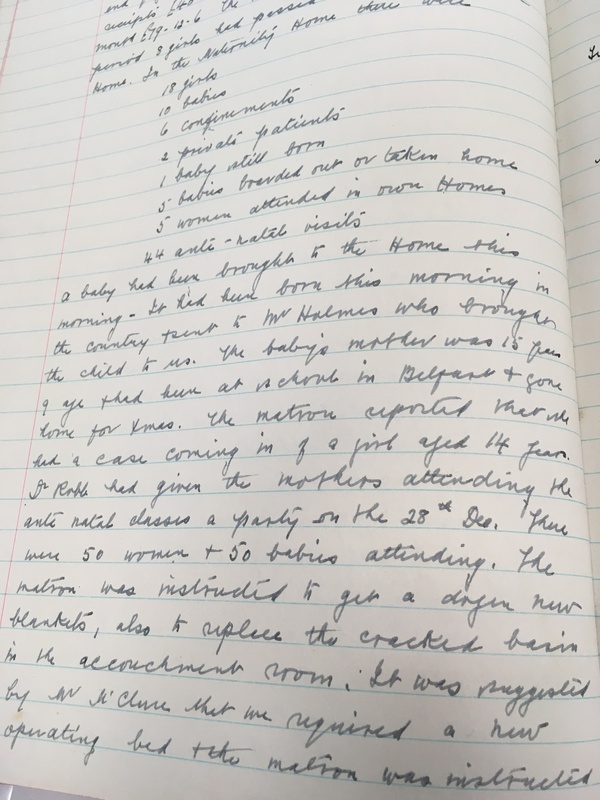 An Ulster Medical Journal article written in 1986 states that the home, at that time, was under the supervision of Belfast City Council. 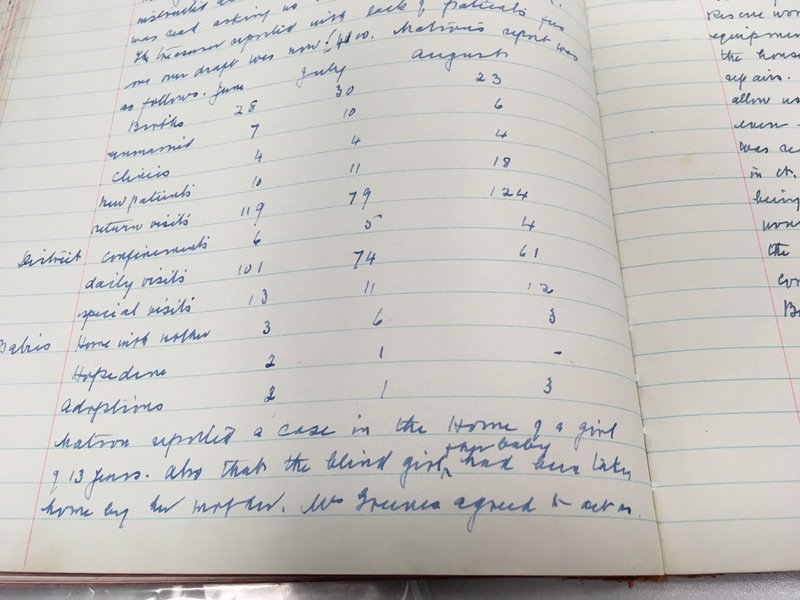 The minute book includes a list of key statistics recorded by the staff each month relating to the women and children staying in the home. As well as births to unmarried women, there were also some private patients and babies born to married women. 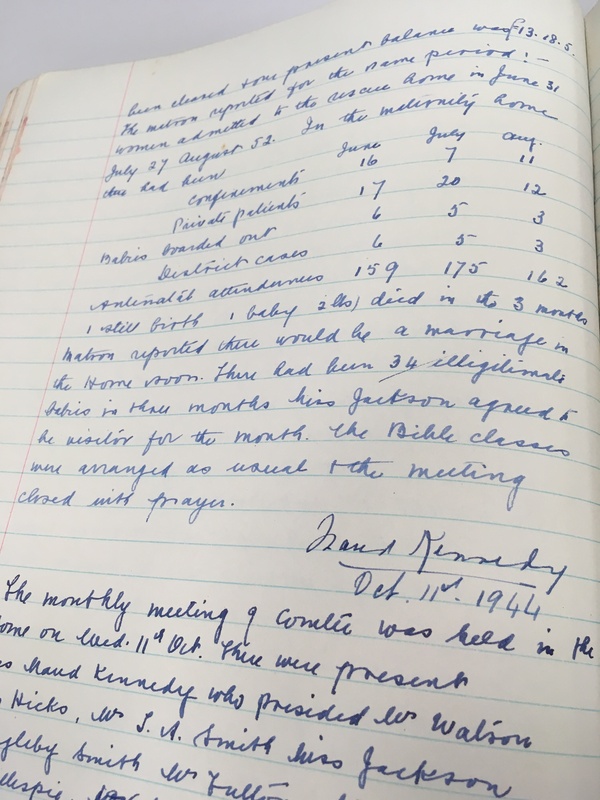 We looked in detail at the statistics provided in the minutes for meetings which took place in 1948. There were 304 births at the mission in that year alone – at least 141 were to unmarried mothers. There was one maternal death, two stillbirths and one baby died. In 1948 17 children were adopted, 25 went home with their mother, a further three cases are listed as “home found”, three children were fostered by being “boarded out” [fostered] or "nursed out” and 12 children were sent to other homes (Hopedene, Woodland Avenue and Nazareth Lodge). It is unclear what happened to the remaining children. 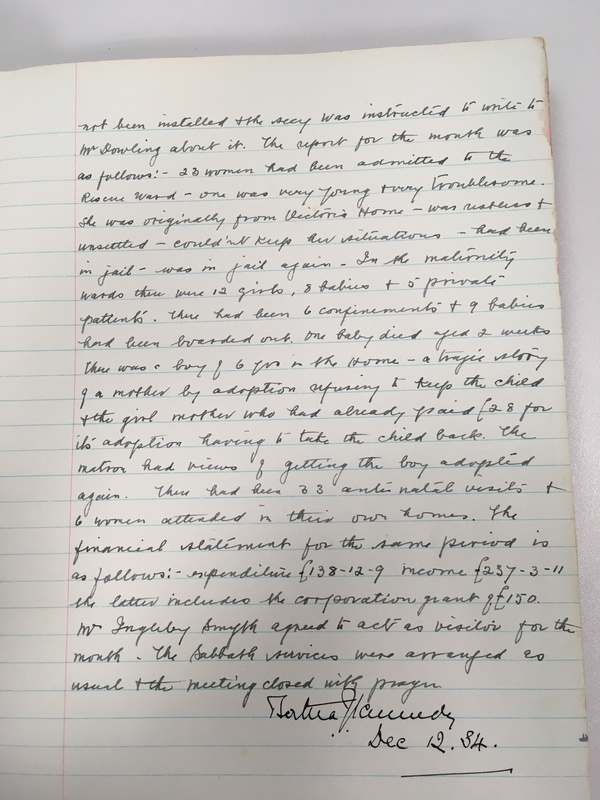 Below are extracts from the minute book. “6 babies had been boarded out”. 8th December 1937: 20 girls in the home, 7 babies, one baby died aged 16 days, 8 babies boarded out. 11th January 1939: 18 girls, 10 babies, 1 baby still born, 5 babies boarded out or taken home. 10th January 1940: 24 girls in the home, 19 babies, 8 babies boarded out or taken home. 10th September 1941: 16 babies, 1 baby died after 2 days, 1 baby still born. 8th September 1948: In June, July and August there had been 81 births – 23 to unmarried mothers. 12 babies went home with their mothers, 3 went to Hopedene and there were 6 adoptions. Another PRONI file holds an appeal for financial assistance which came in September 1945. 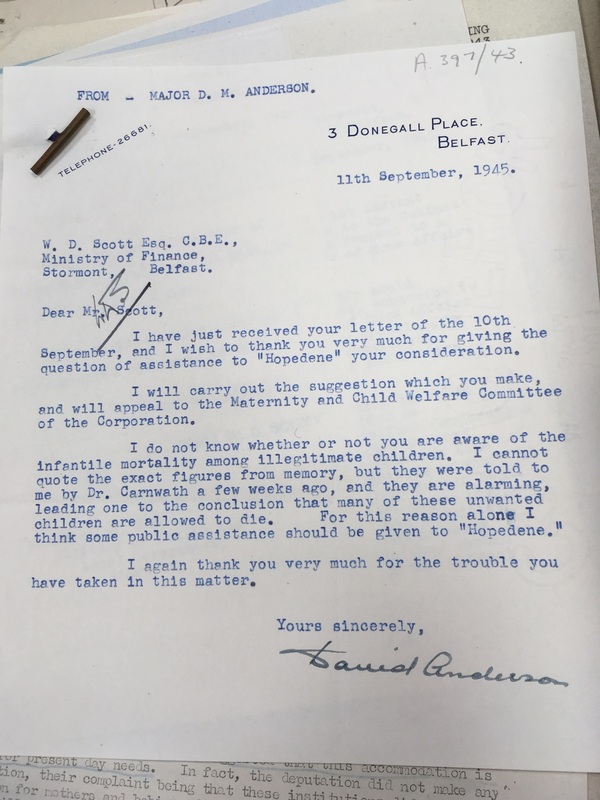 In a blue type written letter to the Ministry of Finance, Major David Anderson – chairman of the committee of Hopedene Hostel for unmarried mothers and their children in Belfast – raised concern about “the heavy mortality figures among illegitimate children”. He asked for “sympathetic attention” to be given to his request for financial assistance for the home established by the Church of Ireland. 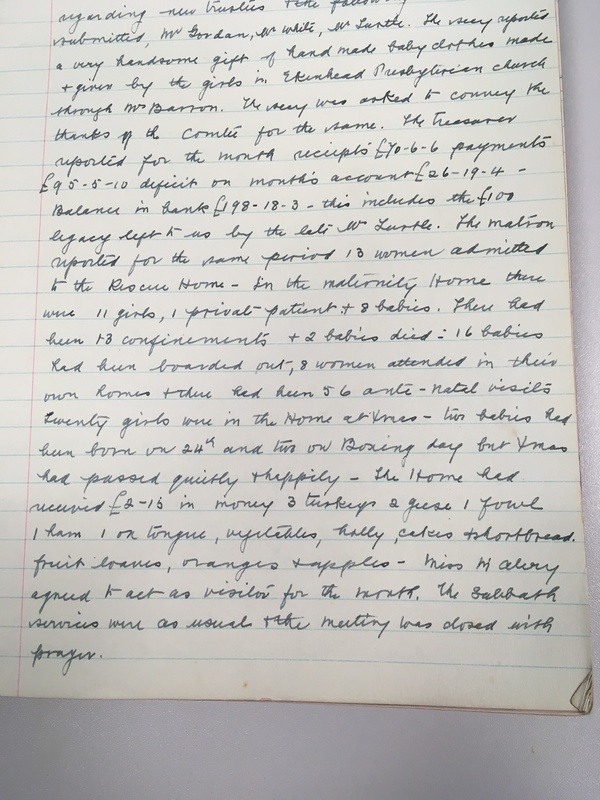 Major Anderson said he believed that “for want of proper supervision many unwanted babies die because of the indifference of those who look after them” and this matter alone, he argued, “is worthy of government consideration and enquiry”. Major Anderson’s appeal for financial support for the home in Dundela Avenue in the Strandtown area of Belfast was rejected by the ministry who suggested that he instead contact the Ministry of Health. He said “for this reason alone” he thought some public assistance should be given to Hopedene. 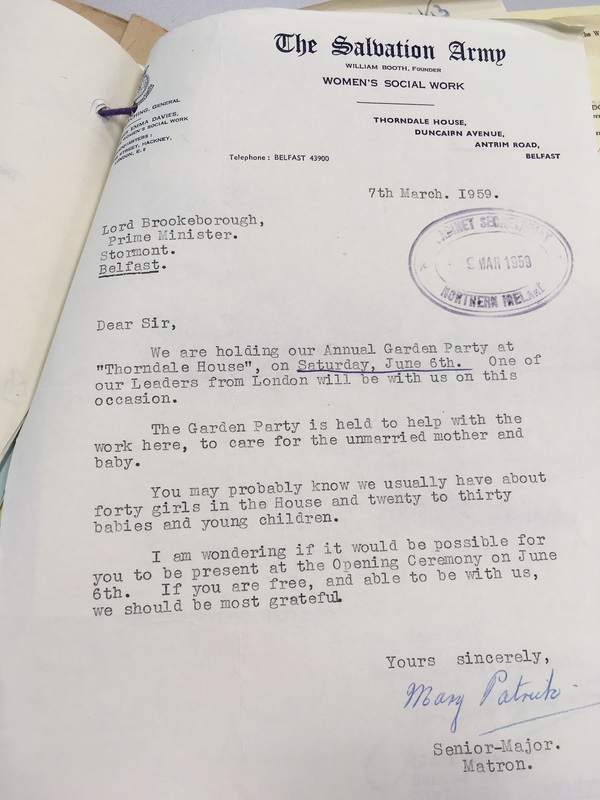 We found a letter in a ‘Department of Prime Minister’ file relating to the Salvation Army in Northern Ireland. Much of the content involved correspondence between the organisation and the PM’s office. One letter referenced the Salvation Army's Thorndale House – a mother and baby home which was based at Duncairn Avenue in Belfast. Written in 1959, it states that they “usually have about forty girls in the home and twenty to thirty babies and young children”. 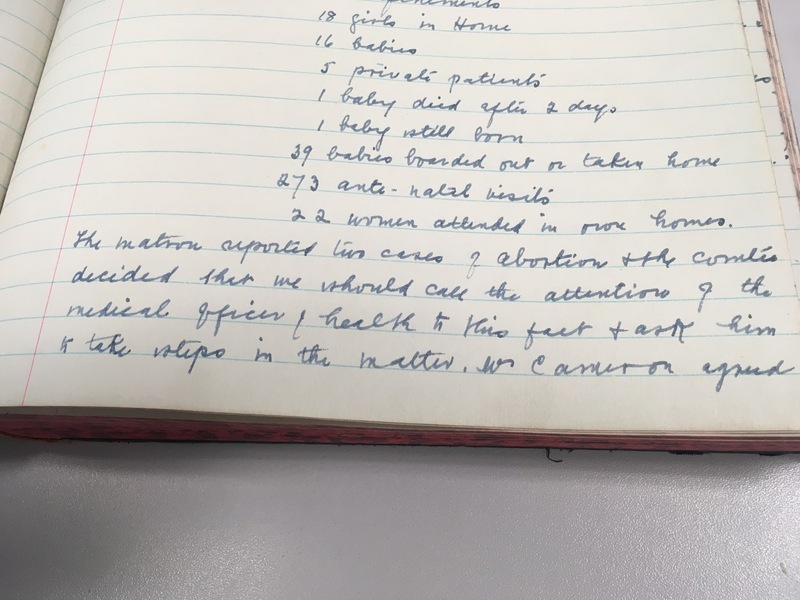 We contacted the Salvation Army but it was unable to provide us with any other statistics or documents relating to its residential units for mothers and babies in Northern Ireland. A spokesperson on behalf of The Salvation Army told Detail Data: "We were one of a number of churches, charities and social agencies working in partnership with social services and health services and provided residential units for mothers and babies. “There were extreme social pressures on young women and their families to give a child up for adoption or fostering. Social pressures have evolved, as has the social welfare system. "Our policy was that adoption outside the birth-family should be a last resort. "Due to data protection rules we are unable to provide national statistics on the women who stayed in these residential units. "Our Family Tracing Service has an established track record of finding people and would work to trace individuals and family members if contacted." The spokesperson added that the Salvation Army would support the call for an inquiry into Northern Ireland’s mother and baby homes. PRONI holds a Department of Health and Social Service’s file relating to St Joseph’s Babies’ Home in south Belfast. The documents in the file relate mainly to inspections which took place at the home. The dates below refer to the date an inspection took place and the information which follows is contained in notes made after the inspection. These documents show that between 1964 and 1967 193 children were placed for adoption from this one home alone. 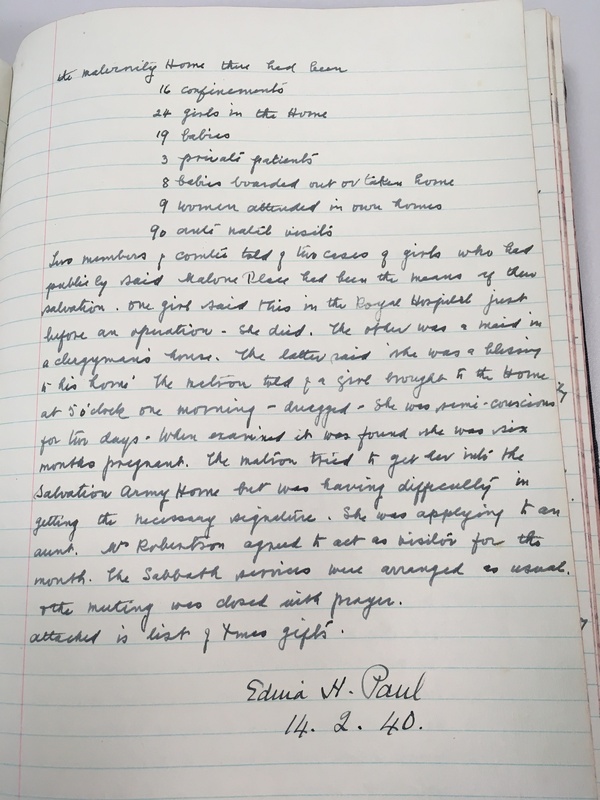 September 22nd 1959: inspectors visited the home to enquire about an outbreak of gastro-enteritis which had led to the death of an eight week old baby. There were 86 babies in residence on the day of their visit. May 20th 1964: 75 children in residence. During the current year about 14 children had been placed for adoption. The work of the Adoption Society “continues to flourish”. The admission and discharge register and records of adoption were well maintained. 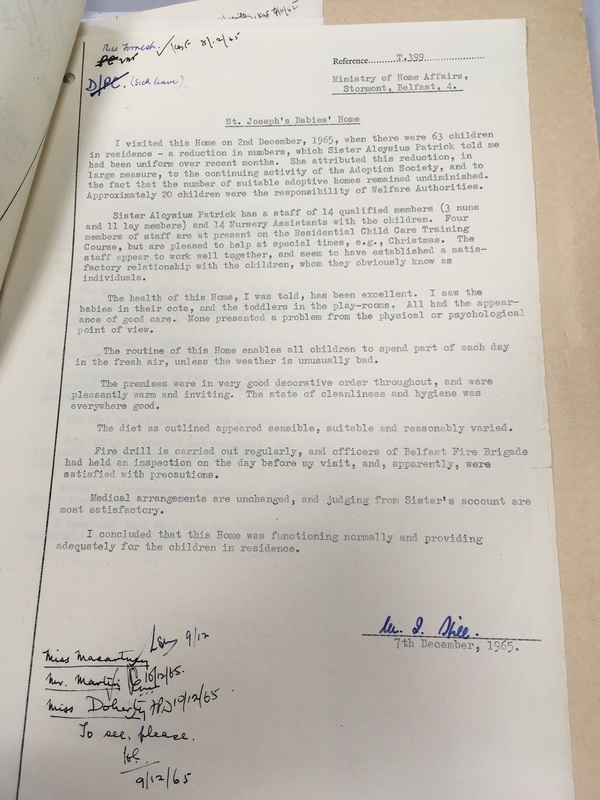 An inspection note dated 13th April 1965 refers to 75 children being in residence, many of whom were the responsibility of welfare authorities. 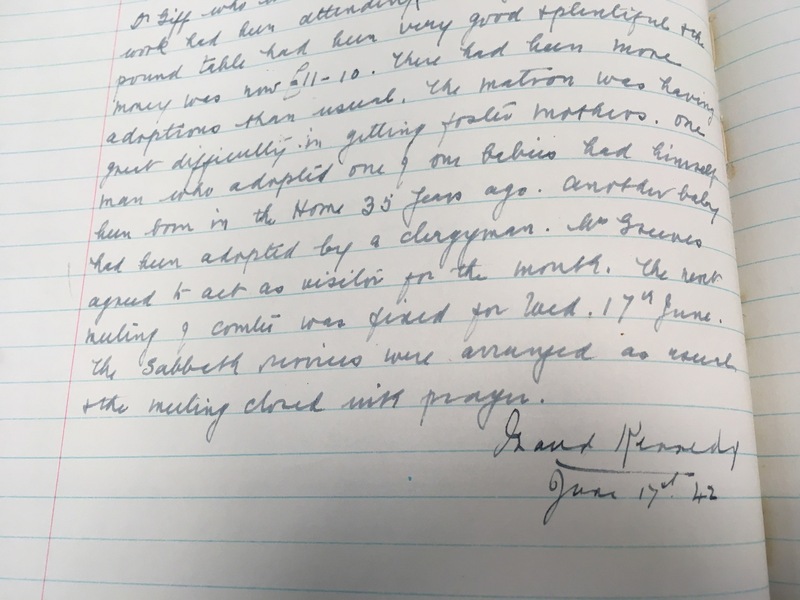 And: “Sister told me that during the year 1st April 1964 – 31st March 1965, 62 children had been placed for adoption from St Joseph’s and eight older children from Nazareth Lodge.” The relationship between staff and children “seemed a happy one”. August 1966: There were 62 children in residence and during the year to the end of March, 60 children were placed for adoption. 16th July 1968: There were 63 children in residence in the age range 0-4 years – “older children having been admitted to keep children together”. About 40 of the children were aged under one. Two babies had died from a respiratory infection “in spite of prompt and efficient treatment”. 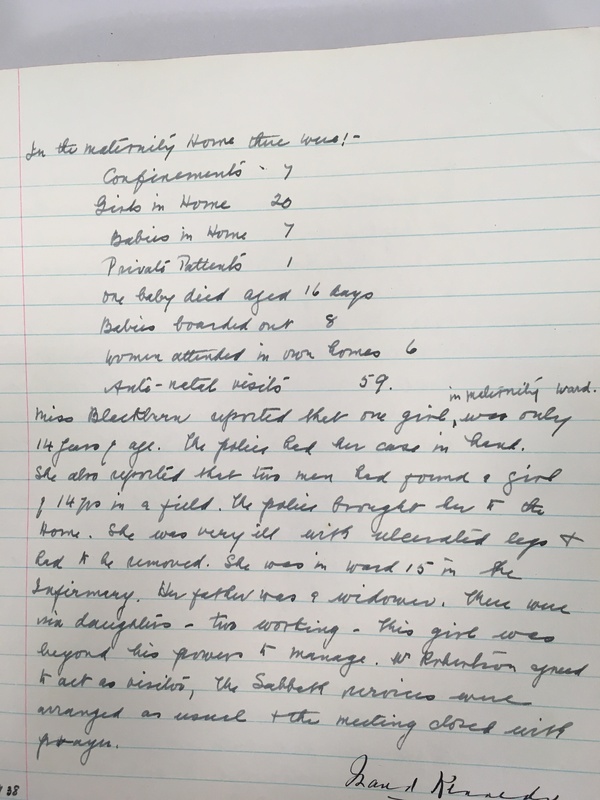 The document also says that the inspectors were surprised to find that medical records were no longer being kept in the home. The inspectors made it clear that medical records needed to be kept and must be available for inspection. FIN/18/23/208: Ministry of Finance file on ‘Hopedene Hostel – Accommodation for unmarried mothers and their children’. 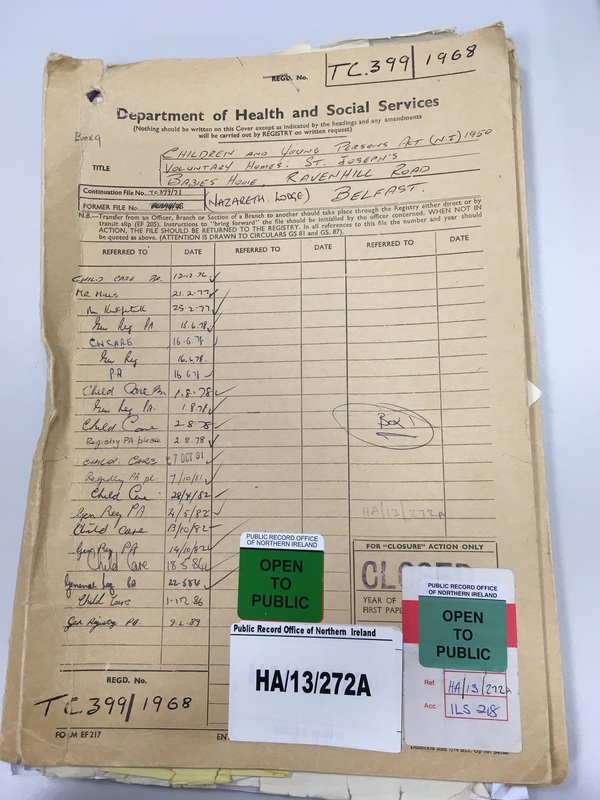 HA/13/272A: St Joseph's Babies' Home, Ravenhill Road, Belfast (Nazareth Lodge) – Department of Health and Social Services’ inspection file. D2072/1: Minute book of the Belfast Midnight Mission (Malone Place) June 1934 – October 1949. HA/13/159A: Department of Health and Social Services file: Welfare Authorities, Annual Statistics, Returns of Children in Care (1960-1969). PM/6/24: Department of Prime Minister file - The Salvation Army (1923-1943). MIC1D/91/6: Register of interments in the Roman Catholic Cemetery (Public Ground), Milltown, Belfast (1922-1982). Microfilm only.